Dr French is the ultimate app to learn and master French grammar. Designed for all levels of French learners, from beginners to experts. We are a team of French teachers with a view to helping learners from all over the world understand the workings of French grammar. Our lessons range from level A1 (beginner) to C2 (advanced), and our varied exercises will help you practice and strengthen your skills. 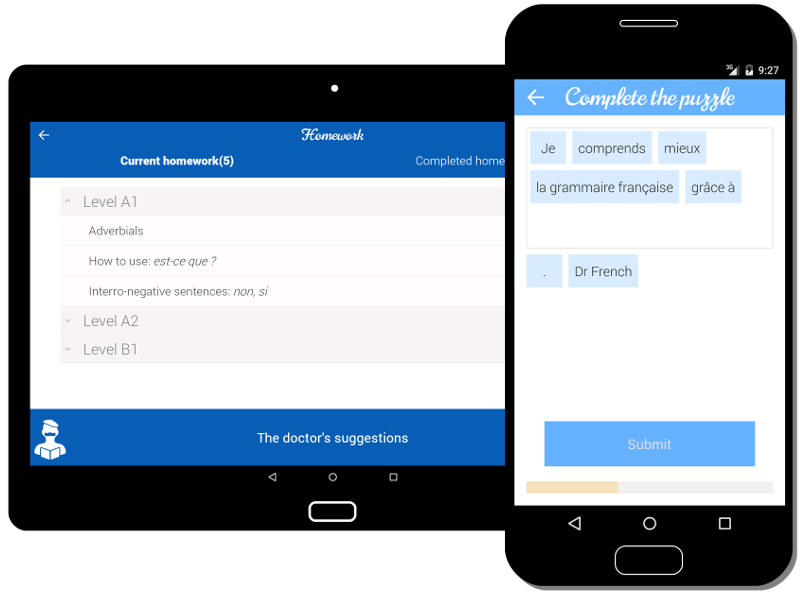 Review French grammar anywhere: on the bus, on the tube, at home or between meetings. No Internet access is needed. Add lessons to your homework in one click and review them whenever you want. To ensure a regular progression, you can ask Dr French to add lessons to your homework, at the frequency and level of your choosing. Using our search bar, you can enter a word or a notion that you are interested in and directly access the relevant lessons. Learn at your own pace without annoying ads and popups. You only get the notifications you request. Dr French focuses on French grammar, not on vocabulary. We believe that's the best way to achieve a solid French language foundation. If you encounter any problem with the app, our team is here to answer your questions!